Friend of the Beaches Award. The Friend of the Beaches Award honors individuals, businesses or organizations who have greatly contributed to enrich our quality of life at the beaches. Doug Brown has been an educator at Fletcher High and Middle schools for over 35 years. For 16 years, he has been the sponsor of the Fletcher High School Interact community service club where he has organized student support for several community service events, such as beach clean-ups, sea oat planting, the Donna Marathon, Atlantic Beach Art Fest, Dancing in the Streets, and the All-Fletcher Reunion for the Beaches Museum. Under his guidance, the Interact club students have raised over $100,000.00 to provide ten canines for the K9’s for Warriors program, $40,000 for 200,000 meals for StopHungerNow, $30,000 for BEAM and $5,000 for the USO No Dough Dinner. 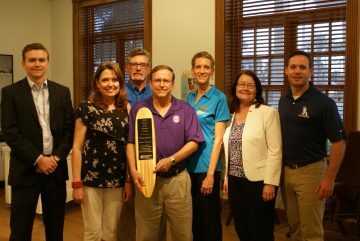 “Beaches Watch is proud to recognize Doug Brown for his efforts to enhance the quality of life at our beaches by educating our young adults to make a positive impact in their community,” said Sandy Golding, Beaches Watch President. Previous Friend of the Beaches Award recipients have been Pete Modica, Mary Emerson-Smith, Bennie Furlong, Marcy Silkebaken, the River Branch Foundation, Gretchen Ferrell and the Beaches Local Food Network, the St. Johns River Ferry Task Force, Lillie Sullivan, the Beaches Branch Library, Kathy Christensen and the Beaches Neighborhood Accountability Board.